Ever wonder how other entrepreneurs and small business owners build businesses that reflects their values? What areas do others tackle first? Which of their efforts have been most successful in terms of impact and revenue? Which have been the most challenging? Social innovators and small business owners Peter Korchnak and Megan Strand found themselves fortunate enough to work in a community that valued sustainability, Portland, Oregon. 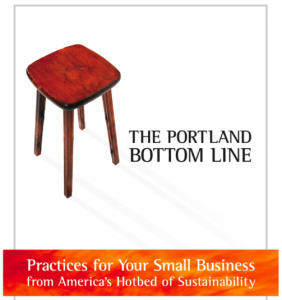 Drawing on conversations and shared best practices with local business owners, they crowdsourced a book that chronicles 51 Portland-based small-business owners’ experiences with sustainability, The Portland Bottom Line. Contributors to the book chose Mercy Corps Northwest to benefit from 100% of the revenue after book printing costs–a phenomenal statement reflective of the characters of the book’s authors and contributors. You can purchase a copy of the book and send $7.54 to Mercy Corps here. In this sample essay from the book, Noland Hoshino, chief social strategiest at [B]cause Media Social Media Communications talks about how his firm differentiates itself externally and internally with a unique payment model and a service rewards program to encourage volunteering. The title of this chapter is a model worth practicing, both personally and in business. Your value and significance isn’t what you have, but what you give that develops a lasting impression. The fancy car, the designer clothes, and having the latest tech gadgets are forgettable after a few days. What’s memorable are unselfish acts and giving practices that define your character; donating those designer clothes to a homeless shelter or using that fancy car to deliver meals to the elderly and sick. As a small business owner, I wanted to ensure that our company incorporated a sustainable giving model that reflected our beliefs in engaging and motivating businesses for the greater good. In a growing market, small businesses must differentiate themselves in order to remain present, relevant and above the fray. It can be done externally or internally with services or products that are unique from the competition. We do it with a payment model that donates to charities or encourages community volunteering, which aligns with our motivation and passion to help others in need. We donate 5% of our service fees to a client’s chosen charity or nonprofit organization. Often, this is the first time the client has made a charitable contribution. It opens the door to further discussion of giving back and building long-term sustainable relationships in the community. It also provides the business another incentive to succeed so that they can continue to make contributions and become something greater than a brick-and-mortar or services business. We encourage volunteerism with a Service Rewards Program. For every hour that the business volunteers in the community, while under contract, we donate $10 to their chosen charity or nonprofit organization (some rules apply). As the saying goes, “If not us, who?” We want businesses to take action to help others immediately. Studies have shown that corporate volunteer programs have a strong impact in the community with 66% increased partnerships. The benefits are too many and too valuable to ignore. So, who are you? What do your customers think of you and your business? Think of it this way: At the end of day, what do you want the people to say: “We are gathered here today to remember … had a fancy car and cherished it”, or “… gave his time to transport cancer patients to and from chemotherapy in that fancy car he cherished. It was the ride of their life”? Bonus: Authors Peter Korchnak and Megan Strand share their reflections on what they learned from creating the book (and what they didn’t expect). I really like the examples of people who are out there doing what I want to do. Giving back and getting involved. Portland seems to be pretty involved socially. Do you know of any other cities that have business owners that do this well? I need to start looking around in my own community to find out! Hi Rob, agree, it’s really nice to see a city-wide ecosystem of sustainability. But, I would encourage you to look for local resources because many cities have (small) pockets of sustainable businesses and business owners (from experience, I can say that LA, Philadelphia and Washington, D.C. all do). One place to start is to search for a Social Venture Network chapter in your city. Where are you living now? Thanks so much for the great article about “The Portland Bottom Line”. I feel honored to have been a participant and agree with your choice of Noland’s story as an example of creative sustainability in our businesses and our communities. Thank you for being an example of successful, sustainable business. I know it’s not always easy, but you’re setting an important standard and, more importantly, making an impact.